On a business trip to Yokohama in Japan, I found a place where you could get slices of cakes. They had several different cakes, and they looked both immaculate in the Japanese way and delicious. The slices of cake were pre-cut to a standard size and boxed in clear plastic boxes. And there was a counter with a display of whole cakes, and a woman stationed there who could cut slices and place them in the clear plastic boxes to replace any that were sold. So far, so good. But notice I said you could get the slices of cake. You could not buy them. 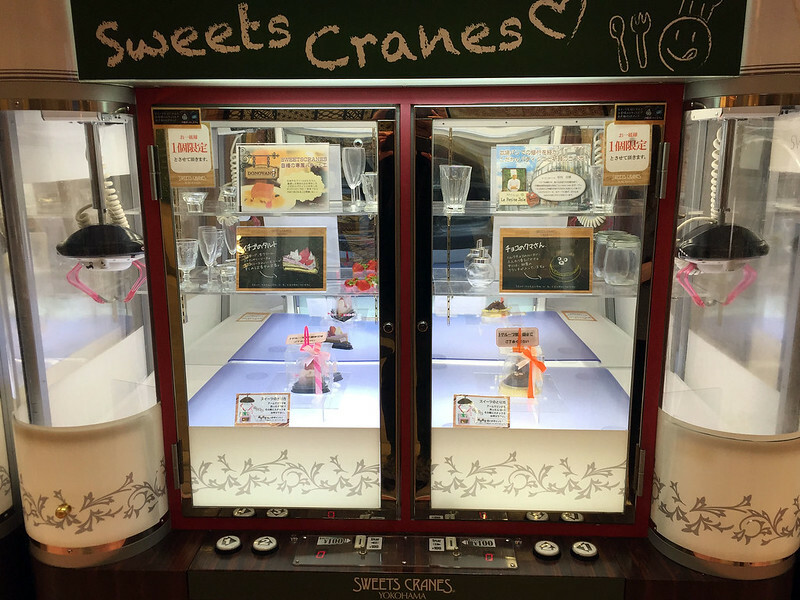 The slices of cake were inside claw crane machines (commonly known as skill testers where I live). To get one, you had to insert some money and play the claw crane game to try and grab a slice and place it in the delivery chute. There was a loop on top of the box that the crane could grab to facilitate this feat. Here's one of the machines, with four slices of cake inside. The price for a "play" was 100 yen - about $1 Australian, or a bit less than that US. A pretty good price for a nice slice of cake. If you got one first try. But maybe you'd need two, three, ten tries to win. Then you've just paid $10 for a slice of cake. And I want to stress again that you couldn't just buy a slice - the woman at the counter would not sell you one. Her only role was to cut slices to restock the claw machines. Some people might define the process of trying to win a slice of cake as gambling. But the claw machine gives it a thin veneer that skill is required, making it a game of skill, not chance. Which in many jurisdictions is fine, whereas gambling is not. The roleplaying moral of this story is that you can dress up anything that might sound dodgy or illegal by applying a thin veneer of something else over the top. Enough to get it past the authorities, while not really accomplishing the intent of changing the underlying thing. You can use this as a GM to present morally dubious dilemmas to the players, or as a player to sneak your own morally dubious behaviour past authorities. This comic makes me feel old. A giant mass of storage cells, a robotic arm: clearly this is some type of gigantic storage jukebox. But looking up storage jukeboxes on Wikipedia only brings up optical jukeboxes. Even the history section of the article talks about optical drives being cheaper than tape. When I grew up, robotic mounted tape drives [Ed: look what we found] were not just archival, but active storage. Optical drives didn't even exist yet. Bria: Right, I'm in! Give me the coordinates of Toprawa! Bria: All right! Come in, Bodhi! Set course for coordinates P-5-S-15. Bodhi: That's... where we are now. Bria: Great, it shouldn't take us long to get there then. Cassian: Get it to tell us where the Peace Moon plans are. Sciri: Crystal in row 72, slot 29B. Bria: Great! Can you get that for us, please? Sciri: I'm sorry Galen, I'm afraid I can't do that. Sciri: You need to use the two-axis remote-claw skill tester. Bria: It's all right, it's not gambling. GM: Exactly. Now, grab your dice. Published: Thursday, 09 August, 2018; 03:11:03 PDT.